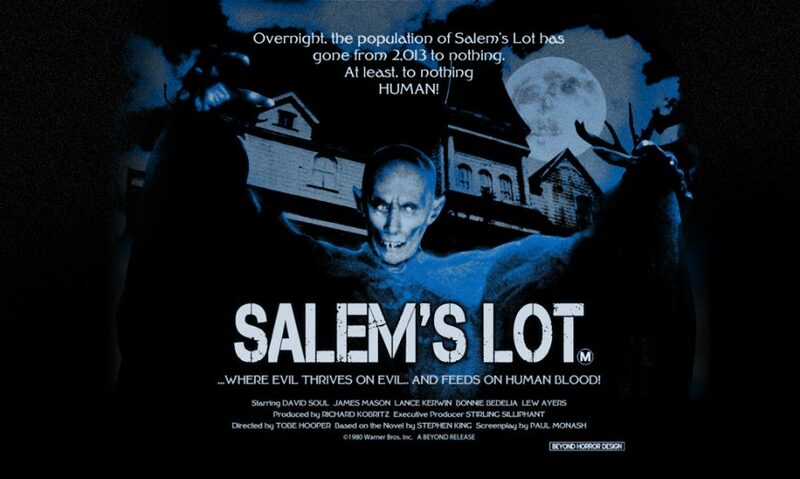 Finally – Salem’s Lot will be airing again! There’s not enough that I can say about this movie and the fact that it’s being shown once again on TV. This Sunday, for Father’s Day, IFC will air the classic two-part miniseries adaptation of Stephen King’s horror masterpiece. Ever since it’s first network airing November 17 – 24, 1979 on CBS, I’ve been looking for it’s release on video, CD, Netflix, etc. It may just be me, but it’s been nearly impossible to find it. As a young teenager, I first read ‘Salem’s Lot and was terrified. Set in the Maine town of Jerusalem’s Lot aka ‘Salem’s Lot, the story follows author Ben Mears, played by Starsky & Hutch star, David Soul, as he travels back to his hometown to work on his novel. Quickly it becomes apparent that the good citizens are mysteriously disappearing or worse, dying. Mears believes the cause is coming from the creepy old abandoned house on the hill, the Marsten House. Plagued by memories of his own childhood, Mears enlists the aid of teenager Mark Petrie (Lance Kerwin) and others to ward off the evil that is once again permeating The Lot. The book has it all – vampires, abandoned mansions, paranoia and King’s incredible attention to every minute creepy detail. Add Tobe (Texas Chainsaw Massacre and Poltergeist) Hooper’s brilliant directing of the subsequent movie and this horror adaptation has the makings of one of my all time favorites. I’m glad that IFC is airing it this weekend. I know I’ll be curled up with my popcorn, wooden stake and cross ready for Kurt Barlow!